"Ah," I thought to myself "a bonkbuster about publishing. Just what I need for a bit of light relief." And boy, does Bestseller fit the bill. 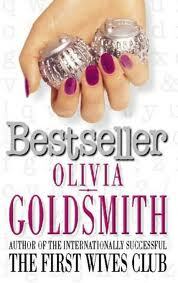 Goldsmith takes you on a rollicking, bumpy ride through the world of publishing. With all of its overblown egos, croneys, champagne parties and hidden talents. Terry O'Neal has spent her whole life writing a magnum opus, but to no avail. Rejection after rejection from literary agents and publishers have pushed her to the limit. Camilla Clapfish (Clapfish...?!) is an aspiring author who has just finished her first novel living in Italy. When she meets an American tourist on holiday with his mother, little does she know how this will shape and influence her life. Judith and Daniel are writing a book together. He is an academic, her former creative writing tutor, and now her husband. She is a true talent. They are eeking out a living on Daniel's paltry salary at the university and he's desperate to hit the literary big time. Just how far will he go to get there? Susann is a successful romantic novelist. She has a lifetime of bestselling novels under her belt, aided and abetted by her partner and literary agent, Alfred Byron. But the latest book is a proving a real struggle to write. And the increasing frustration and impatience of Alf is not helping. At all. Gerald Ochs Davis is top of the literary tree in New York. As head of Davis & Dash, he controls one of the most powerful publishing houses in the world. His backing of an author can make or break them. But does he still have it? The Fall list - including his own blockbuster - will be make or break. Set against a backdrop of ruthlessness and immorality, we see the good, the bad and the not-quite-ugly struggle to survive. This is a world where the benchmark of success is your position on the New York Times Book List. And where you are only as good as your last book. Olivia Goldsmith was quite obviously a flamboyant character. Her acknowledgements page is stuffed full of references to key figures in the publishing world, some of whom make an appearance in the book.